The Sundarbans is a natural region comprising southern Bangladesh and a part in the Indian state of West Bengal. It is the largest single block of tidal halophytic-mangrove forest in the world. The Sundarbans covers approximately 10,000 square kilometers (3,900 square miles) most of which is in Bangladesh with the remainder in India.The Sundarbans is a UNESCO World Heritage Site. 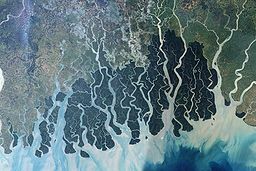 The picture above presents an aerial view of the Sundarbans. Click here for ground level photos. The image at the bottom of this blog posting comes from 350.org, a nonprofit organization that is mobilizing on a global basis to fight global warming. The latest 350.org bulletin, received by me on Monday, January 23rd, seeks to mobilize opposition to a "proposed 1320 MW coal-fired power plant projected by the Indian government’s National Thermal Power Company (NTPC) and Bangladesh’s power development board, through a venture called the Bangladesh-India Friendship Power Company Limited (BIFPCL). According to the National Committee to Protect Oil, Gas, Mineral Resources, Power and Ports, the negative impacts from the operation of this plant will not only put the livelihoods of at least 3.5 million people at risk, but it will make the lives of around 50 million coastal people vulnerable to natural disasters as the Sundarbans also represent a natural safeguard against frequent cyclones, storms and other natural disasters in the country." 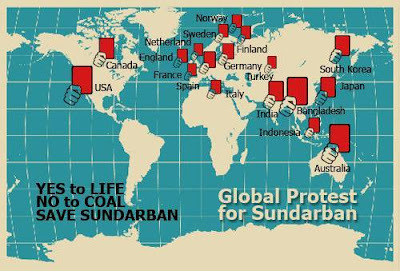 Whether the coal-fired power plant proceeds, or not, the Sundarbans are in great danger. Global warming will destroy them, and as Nature is destroyed, so are the human civilizations that are built upon it. I already knew about the Sundarbans when I got the recent bulletin from 350.org because of an extraordinary book by Amitav Ghosh, The Great Derangement. It is impossible to "fight" Global Warming. Climate variation is not a thing that can be fought against. It cannot be stopped. It cannot be reversed. Climate variation is the natural change on the world's climates that have proceeded on this planet as long as it has had an atmosphere and an ocean. 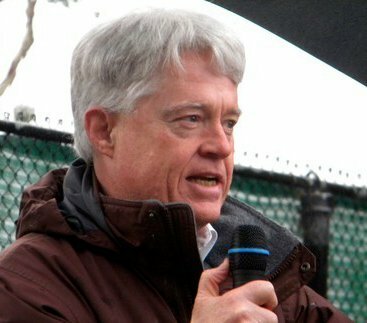 What we can do is to stop human activities that influence naturally occurring climate variation, if that is important enough to governments and trans-national corporations. We can stop driving cars. We can stop heating our homes. We can stop cooking food. We can stop building with wood. We can stop waging war on our neighbors. We can stop filling our garages with useless things. We can stop industrial scale agriculture, stop using petroleum based fertilizers, stop shipping our food for thousands of miles before consumption, stop eating bananas, papayas and other tropical fruits in temperate climates. We can stop flying in airplanes. We can stop shipping goods for thousands miles by airplane and ocean freighters. We can stop buying clothes made from materials shipped for thousands of miles from source to manufacture to sales. If we really want to Save the Sunderbands, and all of the rest of the natural world, we can, and we must, stop western civilization as it is practiced throughout the world today. It's not impossible, and it will happen one day, either by our choice or Nature's choice.